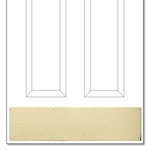 Our door kickplates are available in a variety of finishes to compliment your home decor. 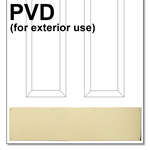 Choose from Polished Brass PVD, Satin Stainless, Polishes Stainless, Oil Rubbed Bronze, Satin Nickel, Pewter, Antique Brass, Weathered Black, Weathered Rust and Weathered Steel. These kickplates are available as a screw mount or magnetic mount options and available in various sizes. Magnetic mount kickplates will not work on wood doors. Need it Quick? Please call 877-852-9449 for availability - otherwise, please allow up to 2 weeks for shipment as most kick plates are made per order. > Start by choosing the finish or brand you want below. Choose a size on the next page. Screw Mount is the most secure and most common type of mount for kickplates. 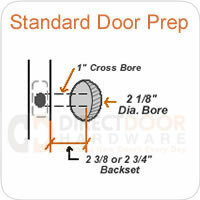 Using a screw mount kickplate will leave screw mount holes in your door if you ever remove it so be sure you want the kickplate before ordering. Screw mount kickplates can be installed on wood, metal or fiberglass doors. Magnetic Mount Kickplates are used on metal doors. The entire back side of the kickplate is coated with a layer of magnetic material to give a nice secure hold on the door so that it will not move when opened and closed repeatedly. 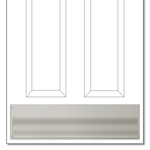 NOTE: Magnetic mount kickplates can only be used on metal doors. 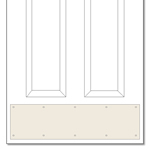 Door surface needs to be clean before mounting. 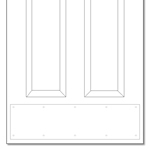 Adhesive Mount Kickplates are used on any door that you do not want to drill with screws. The adhesive mount kickplates have two adhesive strips on the back of the kickplate. To install you clean the surface of the door, remove the adhesive backing and apply firmly to the door. Make sure you line everything up and install the kickplate where you want it the first time as the adhesive is cannot be reapplied. 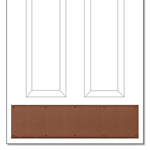 Adhesive mount kickplates give you a clean look wihtout mounting screws similar to a magnetic mount kickplate, but with adhesive you can mount the kickplate to nearly any type of door surface. 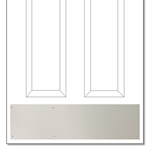 Give your front door new life and protect it at the same time with a quality kick plate. 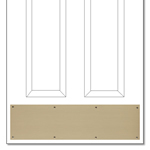 Kickplates are available in many different finishes to coordinate with your entry handleset, door hinges or door knob.